An 1868 graduate of Wabash College, George graduated from Harvard Law School and also pursued studies in Paris and Berlin before returning to Bedford. He formed a law practice with Col. A.C. Voris, until the Colonel retired. 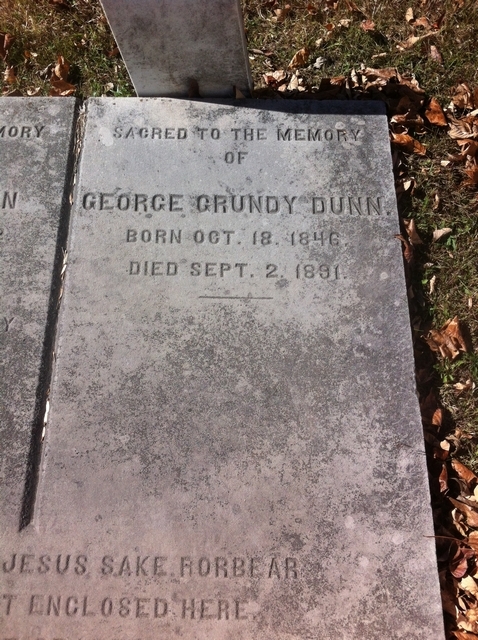 George formed Dunn and Dunn Law Firm with his brother, Moses Fell Dunn, and operated a local limestone quarry. George and Moses resided at the family home on the corner of 16th and M streets until their mother's death in 1870. George married Euphemia Riley in 1883 and died in 1891 at the age of 44, following a serious fall. "Good friend, for Jesus sake forbear to dig the dust enclosed here. Blest be the man that spares these stones and curst be he that moves my bones."